Our Ultimate Guide: How to Buy Cast Iron Bathtubs ….. the CORRECT way! If you’re looking for the best cast iron bathtubs of 2019, you’ve hit the jackpot. On this page, you’ll find our cast iron tub reviews, with 11 of the best cast iron tubs on the market. 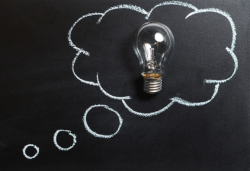 Failing to do your research can end in a headache, so we’re here to help! 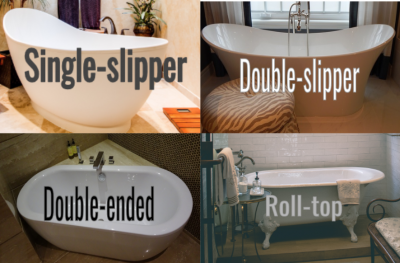 First, you’ll find our comparison chart, with all types of cast iron tubs, including: small, deep, alcove, skirted, pedestal, drop-in, clawfoot, and one with a shower. Next, make sure to read our cast iron tub reviews. 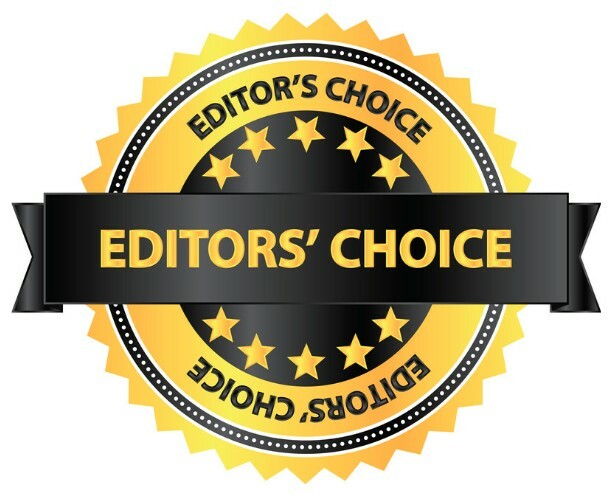 We selected from only the best cast iron bath manufactures, like: MAYKKE, Tub Connection, Kohler, Toto, and Kingston Brass. After that, we’ll tie everything together with our ultimate guide, that includes tips you won’t want to miss. Hope you enjoy! Comfortably fit 2 people, with the Montebello's double-slipper design, that features a large, gentle-sloping rim, perfect for reclining. Easily keep your tub clean, all the time, with the Polk's stain-resistant porcelain interior, and pedestal design (absence of clawfeet to clean). Show off your tile, or give the appearance of more space in your bathroom, with the Chariton's 3 beautiful clawfoot finish options. Single-slipper design, fits 1 comfortably. Enjoy the Vernon's fully-loaded set, that includes: a handheld shower, and "complete plumbing package" (deck mount faucet, supply lines, and drain & overflow assembly). 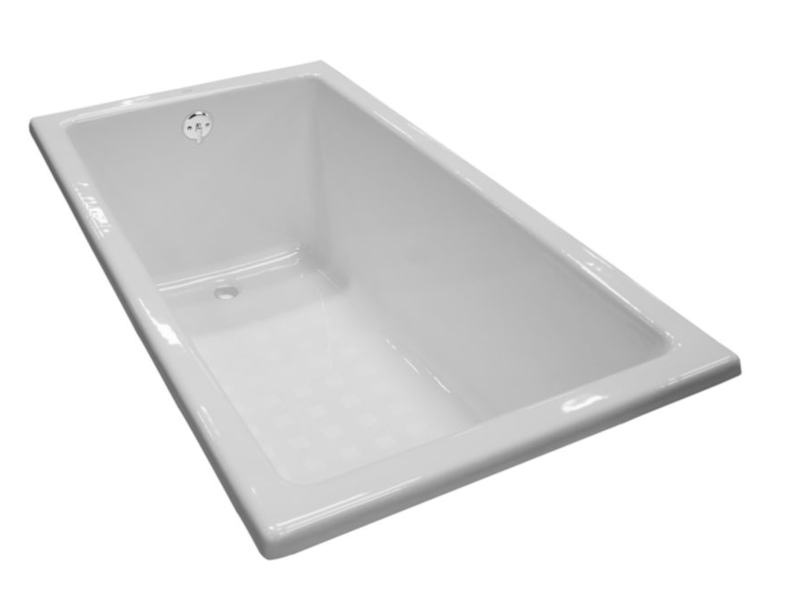 Swedish design, intended for maximum water depth, allows you to sink chin-deep into a warm tub, with an astonishing 18in. to overflow. With its 3 unique clawfoot finishes (brushed nickel, chrome, & oil-rubbed bronze), and different 4 sizes (53in., 60in., 66in., & 67in. ), the Aqua Eden works well in a wide range of environments. 1-of-a-kind, "Imperial-style" chrome clawfeet, make the Katharine perfect for traditionally styled bathrooms, that feature vintage accessories. With its beautiful white clawfeet, perfect for showing off darker tiles, and double-ended design, the Shirley can fit 2 comfortably, in style. At 23 1/4in. 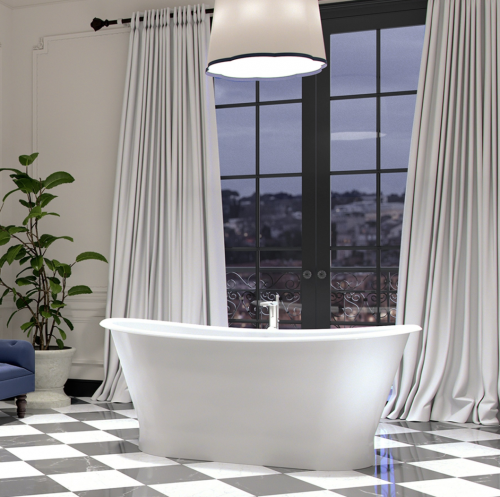 deep, with an ergonomic designed back, the Toto is our most comfortable drop-in cast iron tub available on market. Made in the USA, the Villager flaunts easy-installation, with an already integrated apron. Set-up is made easy, with the Bellwether's "tile flange," that prevents water from seeping behind the wall, and speeds up alcove install process. If you’re looking for the best cast iron bathtub of 2019, that money can buy, this is it. 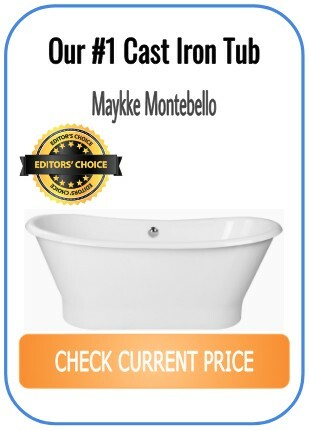 At #1 on our countdown, we have the beautifully crafted MAYKKE Monetbello 70″ Cast Iron Pedestal Bathtub. First thing you’ll notice with this cast iron tub, is it’s wonderful deep oval shape. This shape is PERFECT for someone who’s looking for a cast iron tub that provides a deeper soak than the average. 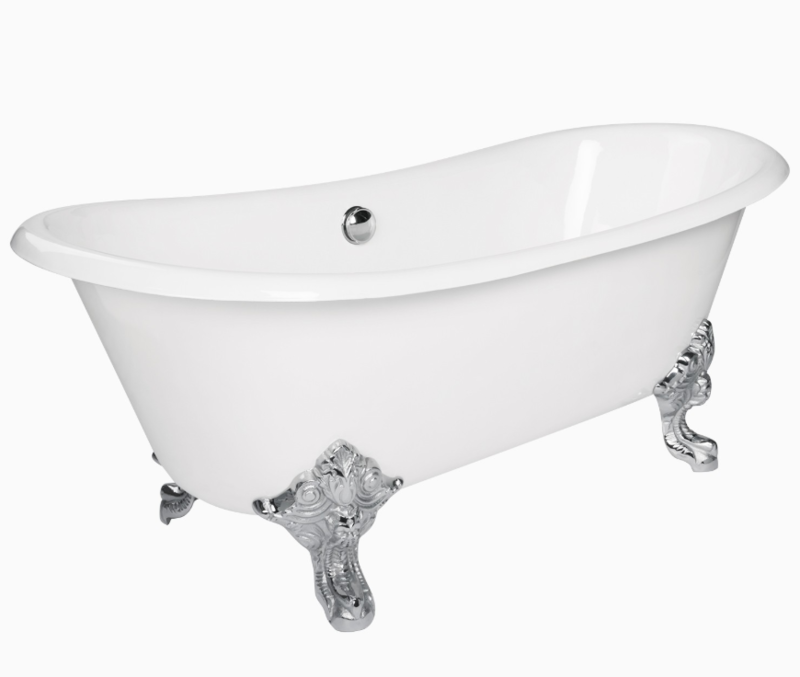 Also, and important to note, this tub is made from high-quality white enamel cast iron. If you haven’t taken a bath in a cast iron bathtub before, prepare to be blow away with it’s heat retention. Having your bath water go cold in 10min is a bummer. Say goodbye to those days. Lastly, and worth mentioning, this tub has flexible installation, as it comes with leveling feet. Luckily, it’s stand alone design doesn’t require remodeling, or deadbolting. At #2 on our list of the best cast iron tubs of 2019, we have Tub Connection’s 60″ Cast Iron Pedestal Tub. This awesome cast iron bath from Tub Connection looks similar in shape to our #1 tub on our list, but it comes in at a much more budget friendly price. 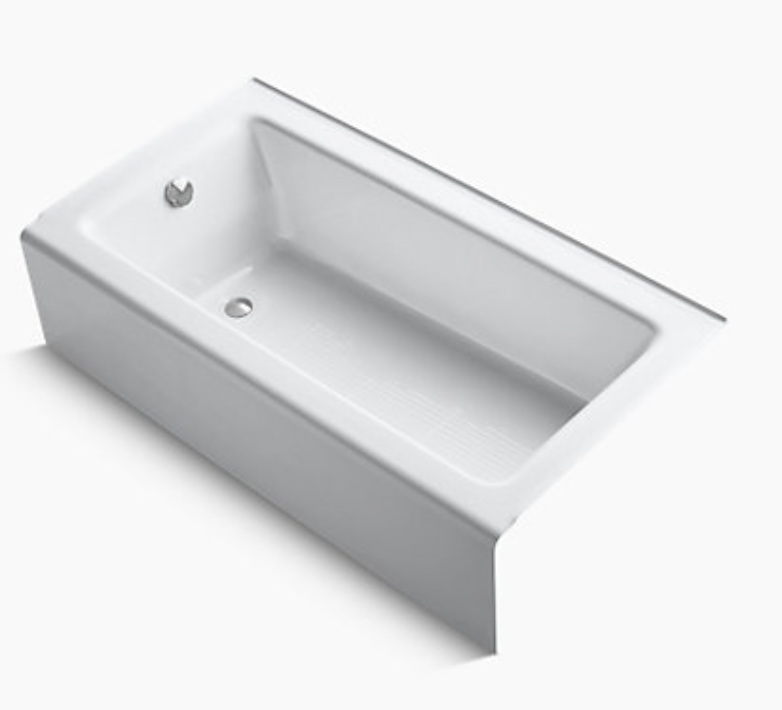 Also, with this tub, we love the functionality of the double-ended design. This way, you can recline at either end, which is a nice plus. To add to the fun, this tub is incredibly easy-to-clean. This is due to it’s pedestal shape. Luckily, you won’t have to worry about cleaning underneath this tub, like you will with clawfoot models. Ultimately, if you’re hunting for VALUE on your search for the best cast iron tub, this is the one for you. Coming in at #3 on our countdown, we have our first clawfoot model, Tub Connection’s 61″ Cast Iron Clawfoot Slipper Tub! If your bathroom is going for the vintage look, this cast iron clawfoot tub is an absolute show stopper. They’re excellent for showing off your tile. 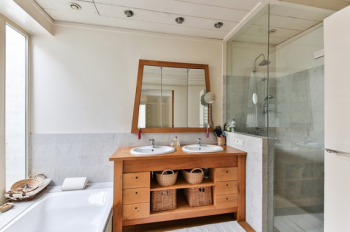 Makes your bathroom APPEAR more spacious (able to see more floor). At #4, we have Tub Connection’s 67″ Cast Iron Clawfoot Tub with a Handheld Shower. Just look … they’re fantastic! This way, you’re able to lay in both directions, or fit a partner, comfortably! Comes in 3 beautiful finishes: oil-rubbed bronze, brushed nickel, and chrome! All in all, if you’re looking for a classic / traditional shaped cast iron bathtub, that comes with everything you need, like a handheld shower, this is the tub for you. At #5 on our list of the best cast iron baths of 2019, we have another excellent clawfoot tub from Tub Connection. This cast iron bathtub has a shorter length (54″) than most of the tub’s on our list, but where it sacrifices in length, it more than makes up for it, with depth. Due to it’s “Swedish” design, most people will find that they’re able to sink chin deep into this tub, for a truly relaxing experience. Also, and worth mentioning, this cast iron clawfoot tub is one of the lighter baths on our list, coming in at 320 pounds. So, if your house is unable to support a heavier cast iron tub, that weights upwards of 400 pounds, this could be an option for you. 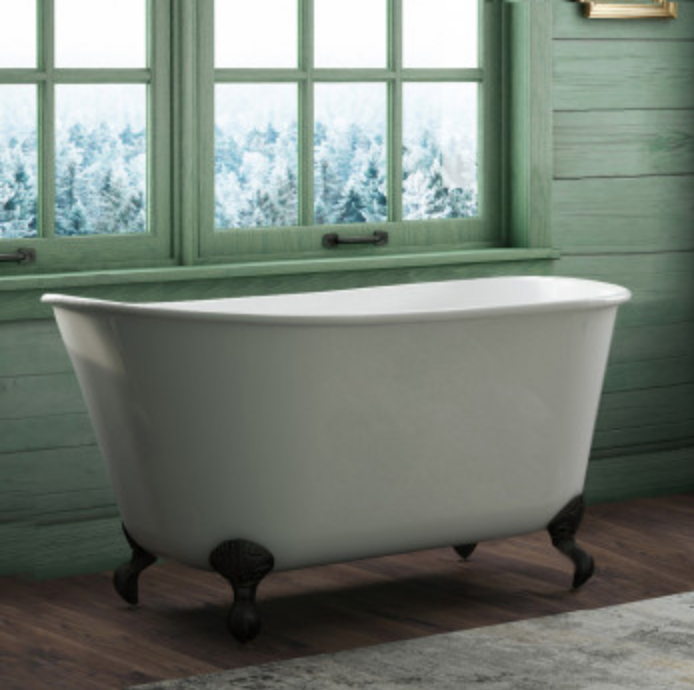 At#6 on our countdown of the best cast iron bathtubs of 2019, we have the Kingston Brass 53″ Cast Iron Clawfoot Bathtub. Kingston Brass has been making top-quality bathtubs for over 20 years, and their cast iron clawfoot tub, is one is their best yet! Looking to fit your tub in a tight space? Great! You’ll love the 53″ single-slipper. Looking to make your tub the center piece of your bathroom? Awesome! You’ll love the 67″ double-slipper. All in all, this clawfoot cast iron bath from Kingston Brass comes in a bountiful range of styles, and sizes, making it PERFECT for your custom bathroom remodel. 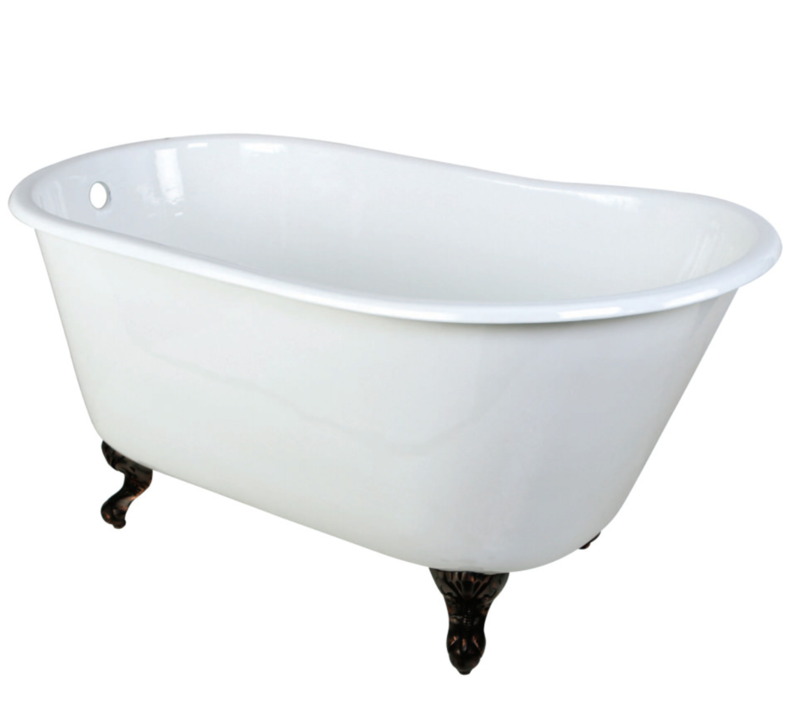 At #7, we have the beautiful MAYKKE Katharine 70″ Cast Iron Clawfoot Tub. Let’s get right into it, and discuss what you’re probably thinking. The clawfeet on this cast iron tub from MAYKKE are AMAZING. The first time you sink into tub, you can’t help but feel like royalty, with its traditional clawfoot design. Ultimately, if your bathroom is going for the vintage / traditional look, this cast iron bath from MAYKKE is a luxurious piece. Can I just say, we love love love MAYKKE’s Cast Iron Bathtubs! Right from the get-go, you’ll notice this cast iron bath has a wonderful double-ended design. Also, and on another note, it’d be a shame if I didn’t mention how stunning the white clawfeet are on this MAYKKE cast iron tub. Just imagine inviting your friends over, and they see this baby sitting in your bathroom. They won’t believe their eyes! 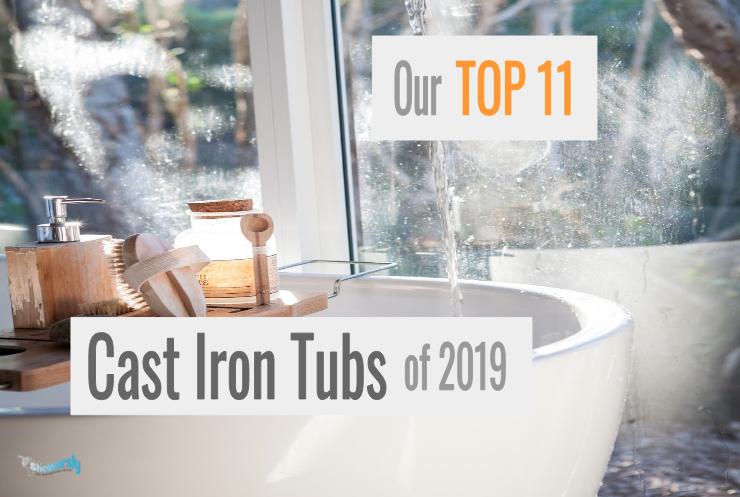 At #9, you’re going to LOVE our Toto Cast Iron Tub review, because it’s our first alcove cast iron tub (drop-in) on our list. If you’re moving from an old acrylic drop-in tub, to the new Toto Cast Iron Bathtub (59 1/16″ FBY1550PN0.01), prepare to be blow away. 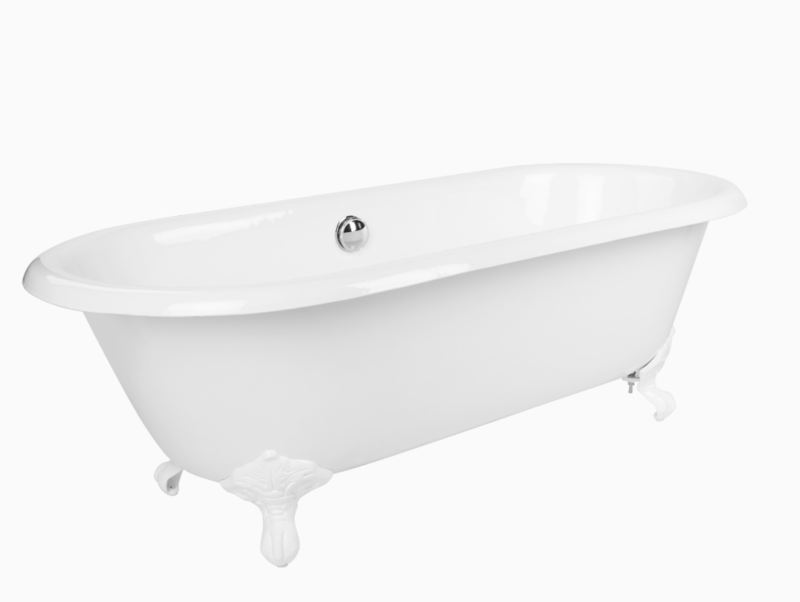 So the next question is … why is this Toto cast iron tub (alcove) better than the rest? Good question! The answer is DEPTH. 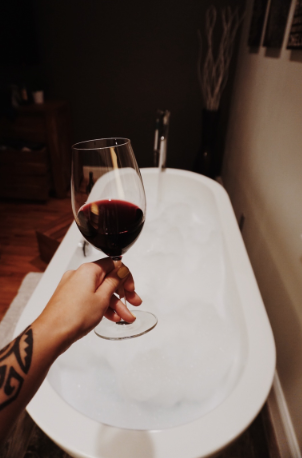 Nobody enjoys bathing in a shallow bathtub, and this Toto Cast Iron Tub (drop-in), at 23 1/4″ deep, is the deepest drop-in cast iron tub we could find. 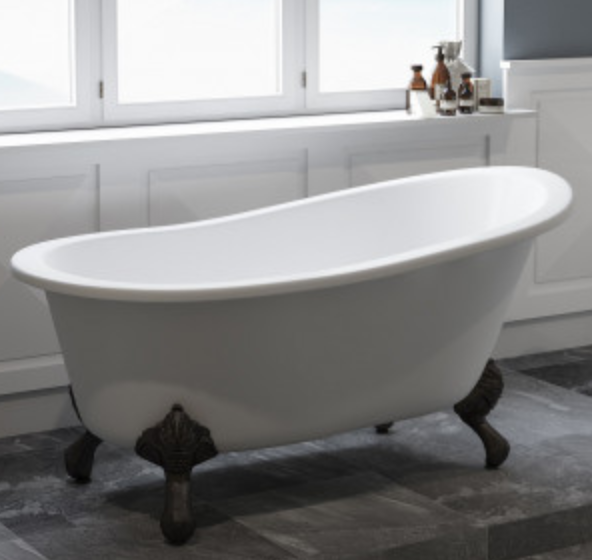 It probably goes without saying, but for good measure, given the Toto’s superior depth, this is also the most comfortable drop-in cast iron tub on the market. Enjoy! At #10, we have an amazing value for you. 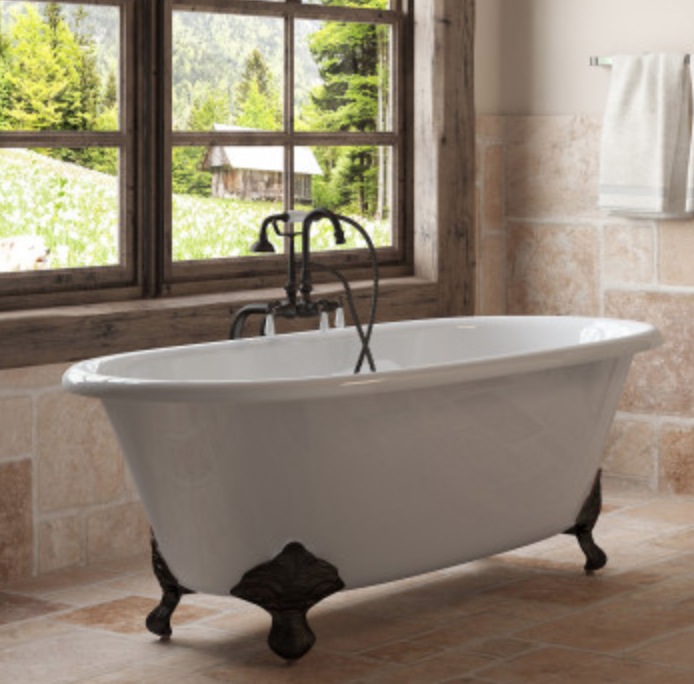 Our 1st of the 2 Kohler tubs on our list, the 60″ K-716-0 Villager Cast Iron Alcove Bathtub. Compared to our #9 tub on our list, this model is going to be a little easier on your wallet, just not quite as deep. Also, its important to note, this Kohler Villager Cast Iron Tub is alcove style, so you’ll notice that it already comes with an apron, or side wall. If you’re looking to enjoy the benefits of cast iron, like heat retention, and durability, but at the same time, you don’t want to break the bank, this is the tub for you. Kohler does an excellent job making quality tubs at a reasonable price, and with this cast iron model, they back it up with a Lifetime Limited Warranty. 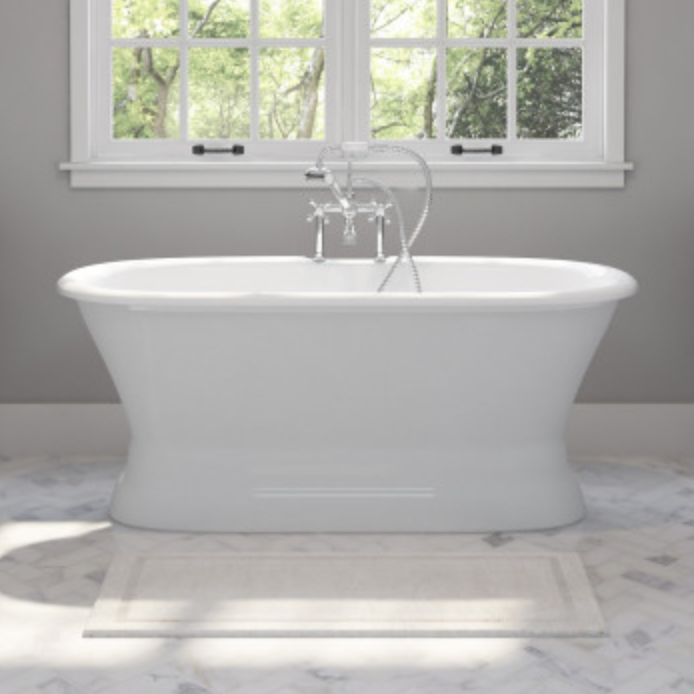 To finish our countdown, at #11, we have the Kohler 66″ 847-0 Bellwether Cast Iron Alcove Bathtub. 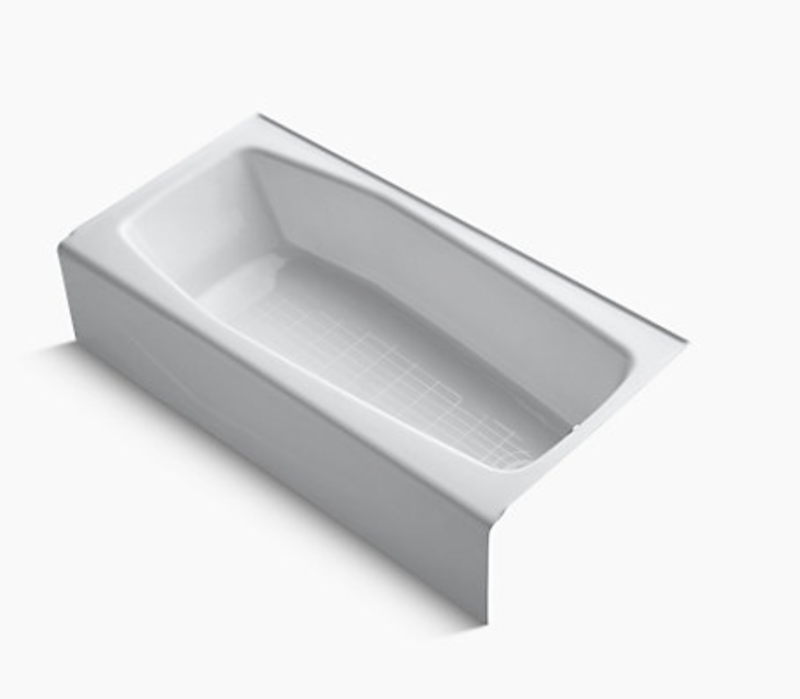 If you’re looking for a cast iron alcove tub with a little more length (66″) than the previous models (59 1/16″ & 60″), this Kohler tub is a great option. Also, and worth noting, this cast iron alcove tub from Kohler comes with a “Safeguard” anti-slip surface. This is especially handy for senior citizens, as bath time can get dangerous as you get older. Another benefit you’ll enjoy with this model, are it’s wide edges. These are perfect for storing all your bathroom goodies like: sugar scrubs, conditioners, shampoos, and more. Like our previous #9 Kohler tub, our #10 Kohler tub comes with a Limited Lifetime Warranty. There’s a right way, and a wrong way to buy cast iron bathtubs. After reading this ultimate guide, you’ll have everything you need to know, to do it the right way. Buying without doing your research is asking for trouble. Knowing this, we’ve done the research for you. Enjoy! The average weight of the all the cast iron tubs on our list is: 370.2 lbs. That average is WITHOUT water. Compared to more standard acrylic tubs, they’re going to be significantly heavier. Therefore, you MUST check if your floor can support the additional weight. If you don’t know how much weight your floor can support … we recommend calling a local flooring company for an estimate. Cast iron tubs are known for their superior ability, over their acrylic cousins, to retain heat. 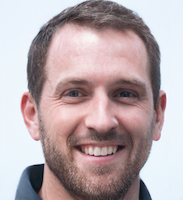 This is a HUGE advantage you can expect to enjoy. With their added weight, comes added durability. 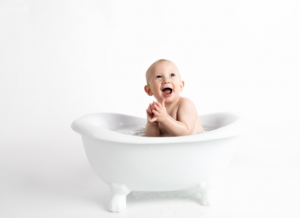 Once installed, your cast iron tub will often last for YEARS longer than cheaper made acrylic tubs. Set & forget! First, you’ll need to measure the dimensions where your tub will go. On average, alcove tubs are usually around 60″ (length) x 30″ (width), but you should double-check your space, including it’s depth. Once you have your dimensions, you’ll need to determine if you need a “right drain” or “left drain” cast iron alcove tub. Simply face your current tub, and see if the drain is on the right-side, or left-side, then you’ll have your answer. 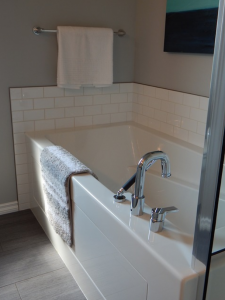 Now that you’ve determined if you need a “right drain” or “left drain” tub, it’s important to note, if your new cast iron alcove tub is a different size, or orientation, than your old one, you might need to re-locate the rough-in plumbing. First, measure your dimensions, and make sure you’re able to fit your new cast iron pedestal tub in your desired space. Next, it’s important to keep in mind that cast iron pedestal tubs are usually taller, when compared to the other cast iron tubs on our list. As the name suggests, these tubs sit upon a “pedestal” which raises them higher off the ground. 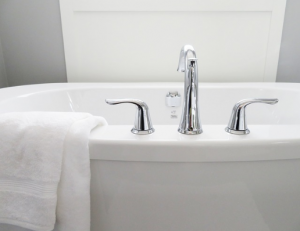 When purchasing a tub filler, to go along with your cast iron pedestal tub, most options will fit just fine, but the added height is something to remember. Also, and keep in mind, cast iron pedestal tubs often come with center drains. This means they can be installed facing either direction (left or right), since the drain is in the middle. Lastly, when buying cast iron pedestal tubs, you should pay close attention to the dimensions of it’s base, and it’s width. A smaller base will show off more tile, and a larger width will often provide a more relaxing experience. First, you’ll need to get your dimensions of your space, a common theme for buying new cast iron tubs. you have a constructed deck & surround, that can support your new tub. 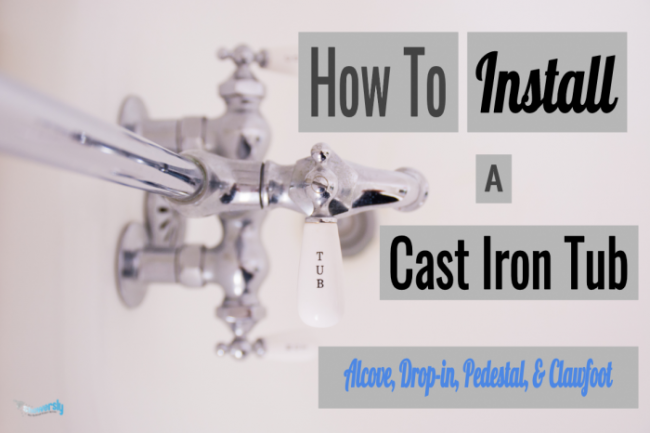 Also, just like with buying an alcove tub, for cast iron drop-in tubs, you’ll need to determine whether you need a “right drain” or “left drain” tub. Finally, pay close attention to the depth of your new cast iron drop-in tub. The deeper, the better. Just make sure that it will fit your current dimensions, otherwise, you’ll have to do some remodeling. First, and you’re probably getting tired of hearing this, but it’s important, you need to measure the dimensions of your space. Next, with cast iron clawfoot tubs, check out those feet! This is why you’re looking at buying these tubs, so make sure you’re getting the best, and most beautiful feet available. Luckily, the feet on cast iron clawfoot tubs will often come in a variety of unique finishes. This way, you’re able to match with your current bathroom finish, or alternatively, move to a new design. Also, and important to remember, these cast iron tubs come in a variety of shapes, and sizes. Ultimately, cast iron bathtubs are an incredible investment. Here are some final thoughts to recap what we’ve learned, and tie everything together. First, remember that they keep your bath water warmer, for longer. This is an absolute GAME CHANGER for those who enjoy long baths. I don’t know about you, but if you’re like me, I can get lost in a bath for HOURS. Next, after reading our guide, you should remember that cast iron tubs are super heavy! Heavier than your average acrylic tub. They range from 300-500 lbs most of the time, and that’s before you add in water. Given their added weight, you MUST check that your floor can support these tubs. The best way to check, if you’re not sure, is to call a local flooring consultant for an estimate. Lastly, now that you’ve completed your research, you’re all ready to ENJOY your new cast iron tub! We hope you learned something new today. Happy bathing! A MUST KNOW Tip: If you didn’t know already, cast iron tubs are significantly heavier than other acrylic-based tubs. That being said, you MUST check if your floor can support their weight.